Press Shift + Ctrl to only see spent points in the skill window. Oh boy, I love you. Really VERY handy! Thanks a lot, stranger! (worst case scenario) on Saturday morning, european time, but I can't tell an exact time yet. After that no downtime is planned for foreseeable future. Hey, relatively new to the forums, but I've been using GrimTools for a long time and really appreciate all the work you've put into it! Clicked through the feedback link to say that I would really love functionality for toggling individual temporary or proc buffs, rather than all or none. e.g. I'm working on a Righteous Fervor build and would like to be able to see the effects of Consecration and Retribution without also having Ascension, Overguard, etc show up as well, since they're "more" temporary than the others. This is on my todo list, seems easy enough, but it's not high priority, so no ETA at the moment. Build sharing is temporarily disabled due to DB migration. I'll let you know when it will be available. Edit: it's reenabled again. Everything looks good now. Last edited by Dammitt; 04-13-2019 at 07:58 AM. 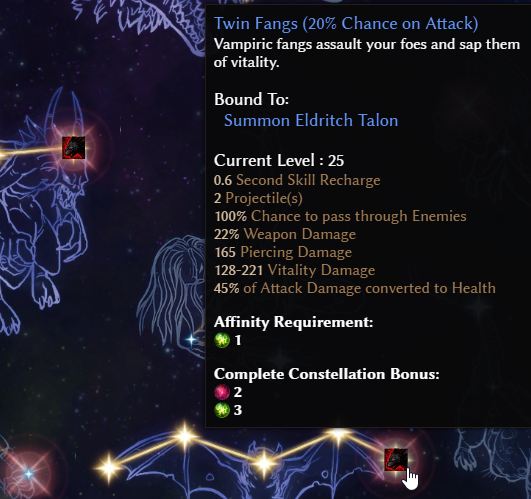 Inquisitor's skill Ranged Expertise doesn't seem to be adding numbers to 2h ranged weapons. Is that intended? Any way to show what level I need to be once I spread out the skills I want? Hi, not sure this has been mentioned before, couldn't find it, would it be possible to implement a way to download a build from the website so that it can later be loaded in the offline version? So https://www.grimtools.com/calc/xyz would have a link to download a GDC file for offline viewing?